— Orly Lobel, Talent Wants To Be Free Back in January, I wrote about "The Techtopus" — an illegal agreement between seven tech giants, including Apple, Google, and Intel, to suppress wages for tens of thousands of tech employees. The agreement prompted a Department of Justice investigation, resulting in a settlement in which the companies agreed to curb their restricting hiring deals. The same companies were then hit with a civil suit by employees affected by the agreements. Genentech, Inc. • Intel Corporation • Apple Computer • Paypal, Inc. • Comcast Corporation Until now, neither Paypal (owned by eBay), Comcast nor Genentech have been publicly mentioned as part of the wage-suppression cartel. Nor have they been publicly named in criminal or civil actions relating to this particular case, although both the DOJ and the state of California are currently pursuing a separate but related antitrust suits against eBay. Please also be sure to honor our side of the deal. 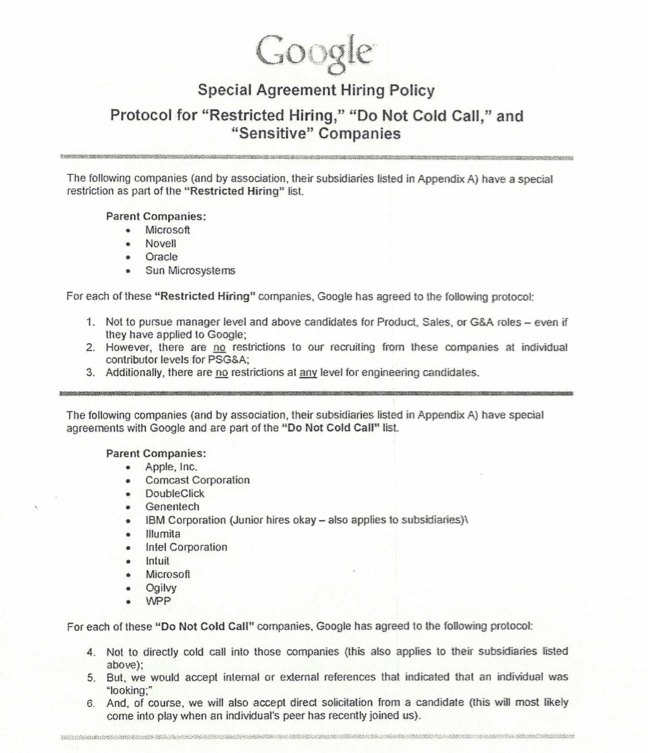 That was February 26; on March 6, Google's identical non-solicitation agreement with Apple became "effective." This is just a tiny sample of the "overwhelming" evidence used by both the Justice Department's antitrust division, and the District Court judge in San Jose, to debunk the company executives' claims that each had coincidentally implemented identical non-solicitation policies at the same time, with the same companies, without knowing what the other side was doing. Google’s “Sensitive” companies list (right) had meanwhile grown to include AOL, AskJeeves, Clear Channel, Earthlink, IBM, Lycos, and NTL, a major British cable company known today as Virgin Media. Some of the companies Pando contacted for this article insisted, off the record, that they had not agreed to appear on Google or Apple's lists, and that there were no reciprocal non-solicitation agreements. Indeed, that same line of defense was used by many of the defendants in the current case. Of course, it's possible that Google, Apple or others simply added companies to their don't recruit lists without coordinating with them first. That said, as we see from the Whitman and Jobs emails above, addition to the list was frequently prompted by an angry phone call or heated discussion. One example of this is Dell who, despite not being listed in the civil suit or DOJ investigation, was included on Google's "don't call" list after an angry email from Michael Dell himself. We'll continue to press companies to comment on the record regarding any discussions which may have caused them to be added to Google or Apple's lists. Apple, Inc • Comcast Corporation • DoubleClick • Genentech • IBM Corporation (Junior hires okay—also applies to subsidiaries) • Illumita • Intel Corporation • Intuit • Microsoft • Oglivy • WPP These combined workforce of just these eleven companies totaled over 775,000 in 2008. The antitrust lawsuit going to trial in May affects only 100,000 employees of seven tech firms (although three have since settled out of court), leaving most of the firms listed on Google’s confidential documents out. All of the above is just what's in the mountain of pre-trial court documents. It's highly likely that more names will spill out during testimony. Pando will continue to report any new developments and also will be covering the summary judgment hearing next week. What’s more important is the political predicament that low-paid fast food workers share with well-paid hi-tech workers: the loss of power over their lives and their futures to the growing mass of concentrated power in Silicon Valley, whose tentacles are so strong now and so great, that hundreds of thousands of workers around the globe—public relations and cable company employees in the British Isles, programmers and tech engineers in Russia and China (according to other documents which I'll write about soon)—have their lives controlled and their wages and opportunities stolen from them without ever knowing about it, all the while being bombarded with cultural cant about the wisdom of the free market, about the efficiency of free knowledge, about the need to take personal responsibility and to blame no one but yourself for everything that happens in your life and your career. Pando attempted to contact the companies mentioned by name in this report, requesting comment on the civil lawsuit (and in some cases, separate DOJ investigations). All of these requests were made at least two business hours before publication, in line with Pando's standard comment request policy. "[T]he current lawsuit against eBay mentions Intuit, but we are not named as defendants in the suit. Regarding the current allegations from the High Tech Employee Antitrust Litigation: Then and today, Bill takes his fiduciary and advisory responsibilities at Intuit seriously, and we believe all of Bill’s actions have fully complied with the law." "eBay continues to believe that the Department of Justice and California Attorney General have taken an unprecedented and aggressive approach to their enforcement of antitrust laws in this instance. Nevertheless, eBay is engaging in discussions with the Department of Justice and California Attorney General regarding the possible resolution of this action and believes that a stay of the action will avoid unnecessary use resources while those discussions are pending." An Intel spokesperson told Pando: "We don't think we violated any laws, and we are going to continue to defend ourselves." A Virgin Media spokesperson told Pando: "Virgin Media operates solely in the UK. I appreciate Google also recruits here but I don’t believe we’re involved in what sounds like a US lawsuit." An Adobe spokesperson told Pando: "Adobe does not comment on pending litigation." A Kelly spokesperson said the company "does not comment on pending litigation against a customer." A spokesperson for Nike told Pando "Nike is unaware of any such agreement and have no further comment."